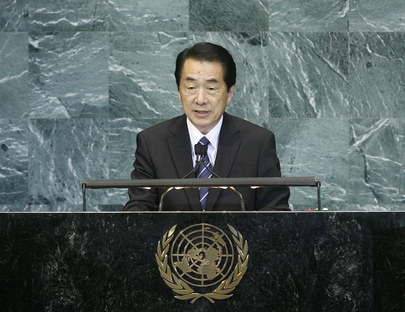 NAOTO KAN, Prime Minister of Japan, shared his vision for the country’s future contribution to global affairs and appealed for a wider range of cooperation among all nations towards resolution of today’s key challenges. He said global change required political leaders to reduce human suffering and to build societies that could sustain — and restore — true peace. Japan had made contributions in four areas, including development, the global environment, nuclear disarmament and non-proliferation, and peacekeeping and peacebuilding. Japan’s successful reconstruction after the Second World War was made possible by the international community. In that regard, he said The Kan Commitment would provide $5 billion in health assistance, and $3.5 billion for education in developing countries over the next five years. Japan would contribute up to $800 million for the global fight against HIV/AIDS, tuberculosis and malaria, and double its official development aid (ODA) in Africa. Regarding climate change, Japan planned to reduce its emissions by 25 per cent by 2020. Next month, Nagoya would host the tenth meeting of the Conference of States Parties to the Convention on Biological Diversity. Turning to nuclear disarmament, he said Japan was the only country that had ever suffered the devastation of atomic bombings and, therefore, had a responsibility to take concrete steps to realize a world without them. He had appointed atomic bomb survivors to deliver global messages about the horrors of nuclear weapons and promote the value of peace. The Democratic People’s Republic of Korea and Iran’s nuclear and missile development programmes posed a great threat to the global community, and he urged the Democratic People’s Republic of Korea to take actions in accordance with Security Council resolutions and the joint statement of the Six-Party Talks. Regarding Japan’s peacebuilding efforts, Self-Defense Forces were sent to assist in the recovery efforts in Haiti and Pakistan, and had military liaison officers in Timor-Leste. Japan was also supporting the peacebuilding efforts under way in Iraq and Afghanistan, and would continue to support the Israeli-Palestinian peace talks. He stressed the importance of United Nations reform, and reaffirmed Japan’s request to become a permanent member of the Security Council. In closing, he said Japan would continue providing an innovative model to help solve many of the world’s problems. He said the country’s creative ideas and use of technology helped make “Made in Japan” a mark of excellence. Widening his perspective, he stressed that, compared with the magnitude of the responsibilities the international community bore for the future of mankind, the differences that divided nations were not great. As such, “everything rests on the decisions and actions we take today”.